First I ate a banana. Then, I thought to myself, "Self, you and I deserve some pumpkin pie!" So I got a small slice. Then I got another small slice. 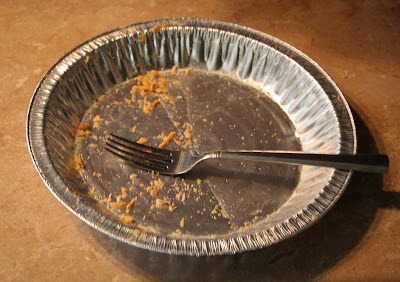 Then, I got out the entire pie pan, and slowly stuffed my face with the leftovers of my first pumpkin pie of the season. All before 9:30 in the morning. I feel so accomplished. wow - "I'm not even mad, in fact I'm impressed!" all I can say is "I,m thouroughly impressed"
Hey, you did eat the banana first. And pumpkin is a fruit too. I think you managed to get all your fruit servings in for the day! Congratulations. That is some achievement!